As a result of the ominous global warming and climate change, countries are continually looking for an alternative source of energy. Motor vehicles have caused a lot of damage to the environment through constant air pollution and the use of fossil fuels. Human-powered vehicles are a means of transport that make use of human power to move. They are an efficient means of transportation and don’t come with the hassles of motor vehicles. When you imagine the electric motor vehicle compared to a human-powered vehicle, you would wonder how it could ever replace motor cars as regards to speed. You will be surprised to discover that an excellent cyclist can produce over 1200w of power in just a few seconds, to move a bike at maximum speed. The speed of the bicycle is determined by the quality of force that the cyclist uses on the pedals and the rate at which the pedal is turned over. If the cyclist pedals at maximum power, the bike will be able to move at a speed of 2m per second. The most exciting thing about it is that there is a lot of research and innovation going on in developing human-powered transport. 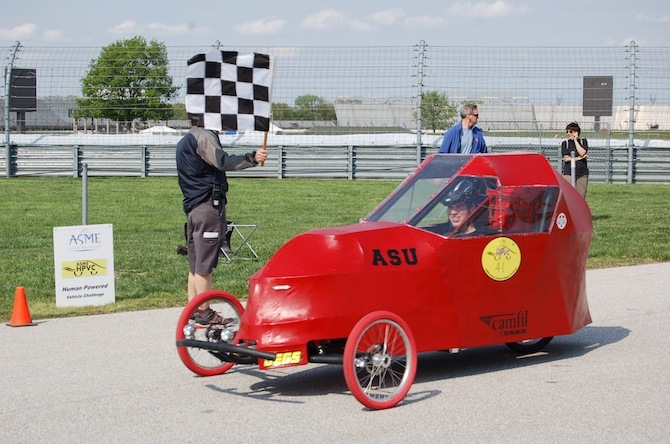 There are a lot of engineers working to produce a maximum speed from human-powered vehicles. These can be seen at the sponsored human-powered vehicle events that are held every year. These vehicles are not limited to bicycles, as there are other means of transport powered by humans, making it easy for people to travel on water, land and air. If human power is adopted as a sustainable transport system today, it will help deal with a lot of issues that we currently experience in transportation today. Human-powered transport is the best option for travelling. This system of transport is much safer than other means of transportation. It doesn’t take up much space, so it eliminates issues like traffic or parking spaces. The primary purpose of transport is to move people, and goods, from one point to another safely. The human- powered cars are designed to protect people from bad weather. They come in beautiful designs and are very comfortable. The velomobiles, for instance, are very affordable, as well as being a clean means of transport. These vehicles will serve as a better transport system, without having to deal with the environmental pollution, that has continued to cause problems all around the world.